I started by sketching that Ringstar logo and used the rest of the paper for random scribblage. Some people have already seen what that logo's for, but I have no idea when I'm going to put that stuff 'out there' just yet. Don't ask. 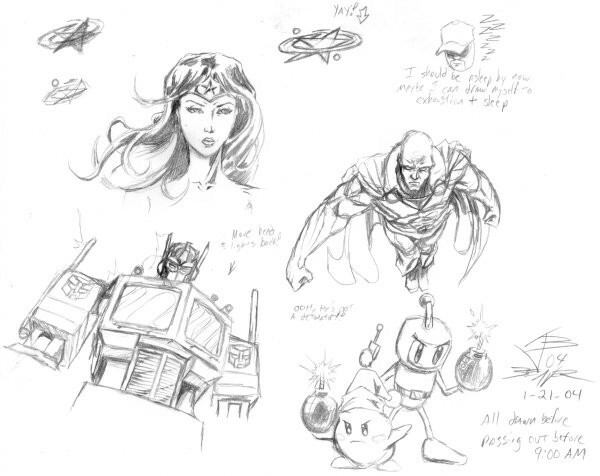 Anyway, the usual stuff: Optimus Prime, Wonder Woman, etc. I shrunk this down too much, but yes, Bomberman DOES have the detenator there. If you got a tingle in your spine about that then you probably know the joy that is playing Bomberman, especially on the SNES with a multitap. AW YEAH. That Kirby looks like crap, but at least he has a Poppy Bros. power up for some bomb action. This puts me one step closer to drawing that 'Video Game Bomb Stars' pic I've been talking about for half a decade now.